The partnership will enable Girosol’s remittance customers to buy Mobile airtime for their friends and family members around the world and stay connected with them at all times. The service is expected to drive additional foot traffic into Girosol’s Agent locations. Berwyn, PA, August 16, 2017 — Girosol is proud to announce that they have launched International Mobile Top-Up (“IMTU”) services through its agent network in partnership with Prepay Nation. The partnership will enable its walk-in customers to initiate a Mobile Top-Up transaction at any of the Girosol affiliated locations. In recent time, IMTU has gained popularity among the immigrant communities especially from the CALA region. It’s a simple and secure way to send a small gift to a friend or family member abroad. The Mobile Top-Up transactions are instantaneous and the recipient receives a credit on their mobile phone in the form of airtime. With over 2,000 retail points of sale in the United States, Girosol is one of the key money-transfer organizations servicing the customers from LATAM region. 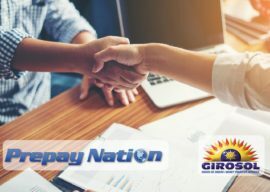 “Girosol’s focus on efficiency and their dedication to provide innovation solutions to its remittance clients makes them a perfect partner to resell Airtime” said Frank Quinones, National Sales Manager of Prepay Nation. “Mobile Recharge has become efficient and the most cost effective way to provide financial assistance to friends and family across international boundaries”.” Most of the Mobile operators in the region offer periodic promotions wherein the recipient receives double or triple the amount paid in the form of airtime credited to the Mobile phones. Digicel & Flow in the Caribbean and Claro, Tigo & Telefonica in the LATAM offer such promotions regularly. Most of these promotional offers are available only when the airtime is purchased in the United States. Prepay Nation is a growth company in the business of distributing International Top-Ups using its proprietary software platform, the prepaid mobile ecosystem and an extensive set of retail, online and mobile channels. With over 220 mobile operator partnerships in 100+ countries and diverse distribution channels spanning over 250,000 locations in the U.S., Canada, Europe and Middle East, Prepay Nation provides a valuable service to expatriates who financially support their loved ones back home. Prepay Nation’s unique business model, scalable multi-currency processing platform, and global interconnectivity with mobile operators and other digital service providers, provides instantaneous and no-fee transactions for consumers and a significant revenue opportunity for distributors. Girosol is a money transfer company that knows the needs of the immigrant community in the United States. We understand our clients’ dedication, hard work, and the financial help they provide to their families for staples, schooling, and living expenses in their home countries. Since 1994, Girosol has dedicated itself to offer efficient, simple, fast, affordable and personalized services to its clients throughout the country. We come from the same places as our clients, that is why we understand that caring for our families is our client’s top priority. Girosol’s goal is to make sure our clients understand that they are not alone. They can count on the highest quality service and have the peace of mind that their transfers will arrive where they are needed, when they are needed, making their families happy.